Put potatoes, onions, salt and water in cooker. Close cooker. Bring to full pressure on high heat. Reduce heat and cook for 3 minutes Remove cooker from heat. Allow to cool naturally, till there is no pressure inside cooker Open cooker. Mix the mixture smooth in a blender or mash it through a sieve. Return soup to cooker. Add milk and pepper. Place cooker on medium heat and bring to boil, stirring constantly. Add cheese and stir till cheese melts. Serve immediately, garnish with parsley. Why pressure cooker manufacturers are doing well in business? A woman’s best kitchen appliance friend is pressure cooker. No other kitchen appliance can be so useful. Without pressure cooker, can anyone come up with good means in such a short span of time? By using pressure cookers, one can prepare sumptuous meal in no time. If suddenly you come to know that guests will be at your place within a short period of time, the only one thing which will save you from headache of serving delicacies is a pressure cooker. When it was first introduced, it sold like hotcakes. Even today, its demand is nothing less than what it used to be at its initial stage. Even in the era of micro oven, importance of a pressure cooker in our daily life is undeniable. Everyone cannot afford to buy a micro oven. Pressure cookers are much affordable and are there in everyone’s kitchen. Food emergencies may come up anytime, especially when you are least prepared for it. Now the question arises how lip smacking food can deliciously be prepared in just half the preparation and cooking time. 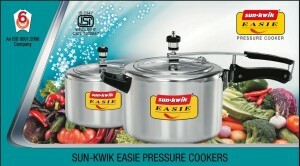 In today’s market there are several pressure cookers manufacturers who sell different models of cookers. It is known to everyone that fast food is not at all good for our health. Then how can pressure cooker become so popular. The pressure cookers manufacturers have proven that food cooked in it is very safe. One has to just slice the diced ingredients and dump it along with other ingredients in the pressure cooker, cover the lid and wait for the food to be cooked. While vegetables take around 5 minutes, meat is cooked as fast as in 15 minutes. With almost all the brands of pressure cookers, a cooking recipe book is given. One can try out several dishes in the cooker from the recipes given in the book.